Enjoy the 4th from the comfort of your home and keep us posted about future travel – and adding to our knowledge about this great country we live in…. I’ll miss reading your updates on your adventure and look forward to future installments. thanks for sharing your travels with your readers! Welcome Home, Jenny and Jim! Congratulations on completing a trip most folks only dream of (apologies for the poor grammar)! We hope that you’ll return to Aiken, SC, at some point. After all, you still need to visit the horses and the Willcox Hotel — with us! Your memoire will be a best-seller. (We know of some publishers if you’d like a reference). It was great fun to share your trip and adventures. Thanks so much for taking the time to write such thoughtful posts. Have a swell summer and perhaps we will meet in NY later in the year. Thanks for reporting out on your adventures, Jenny. 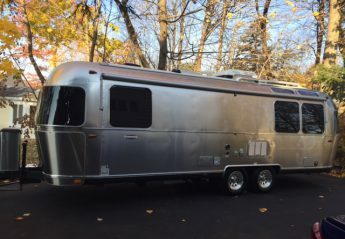 Those of us who have never traveled in an airstream were able to live vicariously through your journey, I marvel at how you/ Jim negotiated some of those tight corners. Could really understand the stress of those moments. Enjoy planning your next great adventure.